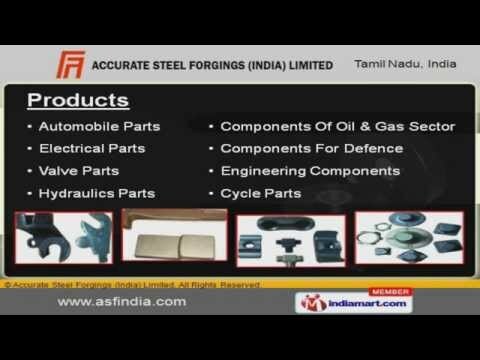 Welcome to Accurate Steel Forgings India Limited, Manufacturer and Exporter of Forged and Machined Parts. Established in the year 1992, we are a TUV certified for TS 16949:2002 QMS. We are Awarded Star performer by EEPC southern region. Easy payment modes, Customized solutions and Long-term relationship with clients are the plus points of our organization. We offer a huge gamut of Automobile Parts, Components for Defence and Engineering Components. Our Automobile Parts are widely appreciated in the market. Electrical Parts offered by us are extremely reliable. We are known in the industry as the manufacturer of Valve Parts. We present a rich collection of Hydraulics Parts that are cost effective. Our Components of Oil and Gas Sector are best in the industry amongst others.